While most of the people believe that office moving is the trickiest thing to be done as the appliances can get broken in between the process, some parts of house removal can prove to be much more problematic. Think about the phase when you have to pack all your crockery along with other breakable things in your house for removal. Chances are quite high in the case you take it as a DIY project and end up failing miserably. Starting from packing to the final removal, you ought to keep a particular eye on the crockery that has to be removed in the process. Packing is inevitably the most crucial part of the entire process, you should think of calling up the professionals associated with interstate furniture removalists in Perth. It determines whether the crockery you are planning to remove will remain resistant to the bumps and jerks of the road or not. Here are some of the essential ways that are required to be followed to make sure the removal of those crockery sets in your kitchen is done without any flaw. The first thing to be done on your part is to buy the right packing boxes specially made for shifting breakable objects. You may obtain the hardwood boxes meant for removal. As you fill it up with the crockery along with other soft material safeguarding those from all the sides, the objects will stay still until the professionals unpack the box and take out all of that one by one. It is crucial to keep a share of bubble wraps along with you before you go for packing the glassware one by one. The bubble wraps are filled with air. The wraps may appear to be soft and delicate. However, until the bubbles get popped up, you can be assured of the fact that the bumps and jerks on the road will not be able to break the glass. People often end up losing all their crockery despite too much of protection just because of the improper arrangement. You are required to know and follow the correct rule of arranging the crockery so that it does not get broken up. 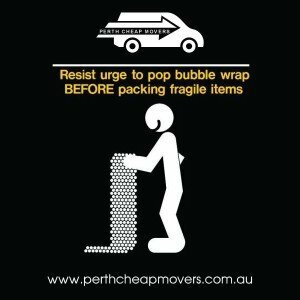 As per the experts of cheap professional removals service in Perth, never place the breakable glassware on the top of each other as it will get broken down from a single jerk. Instead, consider packing those up sideways so that the pressure is distributed and even the breakable glass can resist the shake. Whether you are packing it by yourself or calling up the professionals to get the job done, remember to mark all the boxes carrying fragile objects so that the movers can know what is there to move. They will take added care to the boxes written fragile on the top or side of the box. Therefore, there is no way you should ever forget to label it. The work is not done with packing. You have to make sure the floors are not wet so that the movers face any difficulty and slip on the floor. It can cause a significant accident that you could have never expected. Moreover, choosing a route that has fewer bumps and obstacles will also prove to be an ideal decision on your part to minimise the risk of your expensive crockery set getting broke.